Journeys of heart and mind: What on earth? This is an amazing image for a variety of reasons. What is it? Could it be a pulsating jellyfish from deep in the ocean? An iridescent soap bubble against a black background? Maybe it's a cell viewed in a fluorecence microscope? No, the truth is stranger than any of these. Much of the 'light' you see here is invisible, the rest is far too faint to see. This bubble is the result of a sudden event witnessed by the Saxons, although it actually happened during the Stone Age. The photograph was taken by a range of telescopes, not all on the earth's surface. 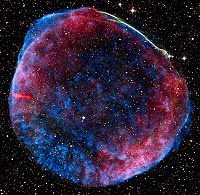 This is SN 1006, a supernova remnant. Everything about it is awesome, almost beyond the human mind's ability to appreciate. And of course it's not on Earth at all. An astonishing feature of this little corner of the universe where we live, our Milky Way galaxy. What is Supernova 1006? How did it happen? How was the image made? Supernovae are exploding stars; but don't worry, our closest star (the Sun) is not expected to explode and will not change fundamentally for about another four thousand million years. It won't affect you! There are various things that might cause a star to blow its top. In the case of SN 1006, a small, dense, white dwarf and a more normal star similar to the Sun were circling one another. As the sun-like star entered its red giant stage, the strong gravity of the white dwarf pulled gas away from the giant's atmosphere. Over a long period of time the white dwarf grew ever heavier at the expense of its neighbour. Eventually it became unstable, and violently exploded in an unimaginable cataclysm (too feeble a description by far, but there are no words to describe a detonation like this one). The mechanism is fairly well understood. The explosion happened about 8000 years ago. The fearsome burst of light and heat roared out and after travelling for around 7000 years arrived at the Earth in Saxon times, about 1st May 1006. The 'new' star was recorded by astronomers in Japan, China, Arabia, and Europe. It must have been noted in wonder by millions of people throughout the southern hemisphere and much of the north. The pinpoint of light outshone everything else in the sky apart from the Sun and Moon. It was visible even in broad daylight, bright enough to read at night. It remained visible for about two years, dimming, brightening again, and finally fading away. As the generations passed it was forgotten. The gaseous debris of the broken star spread out behind the wave of light and heat. The star's substance travelled out so fast that it would have travelled the distance from the Earth to the Moon in less than a minute (it took the NASA astronauts three days). In 1965 it was identified by radio astronomers as a circular feature. This image is itself amazing. It looks just like an ordinary colour photo, but this has very little in common with a typical holiday snap. Like any full colour image this one contains three superimposed images in three different wavelengths. In a normal photo these more or less match the sensitive ranges of the the three types of colour detecting cells (cones) in the human retina. But in this image, a little astronomical imaging sleight of hand has been committed. The red image is not light at all, or not as we normally understand it. It's an image in radio frequencies captured by the 23 mile equivalent 'lens' of the Very Large Array (VLA) and by the Green Bank Telescope. The yellow, orange and pale blue images are visible light recorded by optical telescopes. The deep blue is an X-ray image collected by NASA's Chandra satellite.